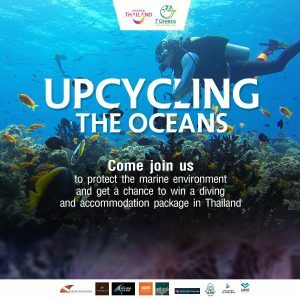 Bangkok (Thailand) – November 7, 2018 (travelindex) – The Tourism Authority of Thailand (TAT) invites all nature-loving divers to help preserve Thailand’s marine environment through the activity “Upcycling the Oceans”. This is an online activity in which Thai and foreign divers share their experiences of scuba diving and ocean conservation in Thailand through the website www.tourismthailand.org/7greens, to educate people about the situation and inspire young divers to preserve the marine life and the beauty of the underwater world in Thailand. All entrants have a chance to win special prizes from leading companies, such as a 44,600 Baht gift voucher from the Similan Seven Sea Club, a 39,000 Baht gift voucher from Beach Club by Haadtien Scuba Club, and more! Join the activity Upcycling the Oceans by registering through the website From today till 16 November 2019 only. The winners will be announced on 23 November 2019. 2. All participants must own a valid diving license. The participants must express briefly their experience of diving and marine conservation. 3. Nine winners will be chosen by the committee from the most impressive entries. The winners will be announced on the website. 4. The winners must verify their identities by the specified date (30 November 2018).